This CD is where blues, folk, Motown and funk have a political soul. Great writing and a funky band back one of the Northwest's greatest voices. "Concrete World and the Lover's Dream is the new tour de force CD from the Northwest's Anne Weiss. Impeccably produced and supported by an amazing cast of musicians, the diverse arrangements and choices of songs on this CD allows the many facets of this jewel to fully shine. Whether Anne is belting out a delta blues tune or singing an achingly tender ballad, every moment of this CD is filled with passion and conviction and reminds us all that if we can't dance...we don't want to be part of any revolution". "I love your new CD. Wow! You are like Tracy Chapman, Eva Cassidy, Bonnie Raitt and Janis Joplin all rolled into one.You are my American Idol." "One of the freshest, most versatile voices I've heard... She ranges from folk to pop to swing to blues, all with a self-assured ease." It's little wonder that Anne Weiss is described as "unique." She studied classical piano, joined a street gang, became a mountaineer, developed a guitar obsession, worked as a political organizer, learned to salsa dance, and became addicted to delta blues; and yes, you will hear it all in her music. Aretha Franklin and Joni Mitchell." Anne's first recording work was with Shawn Colvin and Patty Larkin. It wasn't long before she was opening concerts for Richie Havens and Dar Williams. A decade later, Anne has performed with everyone from power folk singer/songwriter Ani DiFranco to country blues heroes Cephas & Wiggins. She has toured internationally and has appeared at folk, blues, world music festivals, and week-long music workshops. For many of her fans, Anne's lyrics are ultimately what set her aside. Poetic, political, humorous, sensual, full of characters and stories, Weiss came to lyrics through her poetic craft. She has received the Allen Ginsberg Award for poems in her recently published poetry book, Making Paper From Leaves (2002). no strictly solo performer could ever touch." Anne performs with equal ease as a soloist, with her unusual 5 piece funky-folk "Feel This Band", or in duo or trio style with supporting musicians. Audiences are drawn to Weiss's engaging, warm, spontaneous performances, her obvious joie de vivre, and her love of walking out on new musical and cultural edges. RadioIndy is proud to present Anne Weiss a GrIndie Award for their CD \"Concrete World and the Lover\'s Dream.\" A GrIndie Award is RadioIndy\'s stamp of approval that this CD is an excellent quality CD. Please join us in congratulating this artist on this accomplishment. 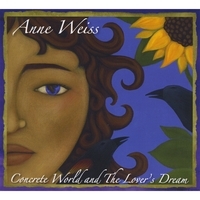 "Concrete World and the Lover's Dream" by Anne Weiss is a funk/blues solo female album with a poetic flair. Anne's voice is one of the more well known in Oregon and for good reason. She sings with her heart and soul. She possesses that great blues quality of grit and grace, and her lyrics are great life stories. Big name artists such as Janis Joplin and Tracy Chapman come to mind when listening to Anne's outstanding music. Anne's musical background is quite diverse and she brings that influence to the arrangements. Hints of urban and latin music are sprinkled throughout the CD, as well as a few other surprises. The band ties the sound together nicely, and are superior musicians. Highlights include "Special Delivery" with its assortment of sounds. You get great vocals, blues, street beats and Motown horns on this track. The title track "Concrete World and the Lover's Dream" makes "Blackbird" pop into your head in the beginning and then evolves into a dirge with a powerful message. Anne also does a real nice cover of Marvin Gaye's "What's Going On" on this CD. If you enjoy listening to outstanding songwriting and outstanding bluesy-rock female vocalists, give this CD a try. I am completely blown away by this CD! The sound is huge, the musicians are among the best in the biz and the songs are all great. Not just a couple of good songs with a lot of filler like so many CDs out there, but every single song on this CD is top notch with hit potential. Anne puts so much into every song, she's in a league very few artists are in. Her vocals are brilliant, the album is filled with high energy fun and gutsy blues and soul, and her interpretations of Marvin Gaye's "What's going on" and Jackson Browne's "These Days" are the best I have ever heard. I highly recommend anyone who likes strong female artists, blues, soul, funk and high quality pop-rock to give this album a listen and fall in love with it like I did. It certainly is the best thing I've heard for a long time and so much better than most anything that gets airplay these days. I can't stop playing this album. Anne's poetic brilliance shines through in a new way, the vocals and instrumental arrangements keep me moving. It's my favorite album of Anne's, and up there with the lifetime faves! Thanks Anne, and Billy and Spank and Janice and the rest of you outrageously talented, fun and inspiring humans! My first Anne Weiss album wins applause from me. Title cut resonates deeply. Anne doesn't hold back speaking her mind and clearly in ways that held my attention both poetically and musically. Well done! !